Spring time in the Algoma Highlands has been spectactular for the past two months!! Plenty of sunshine, clean fresh snow, blue skies, and superb grooming. 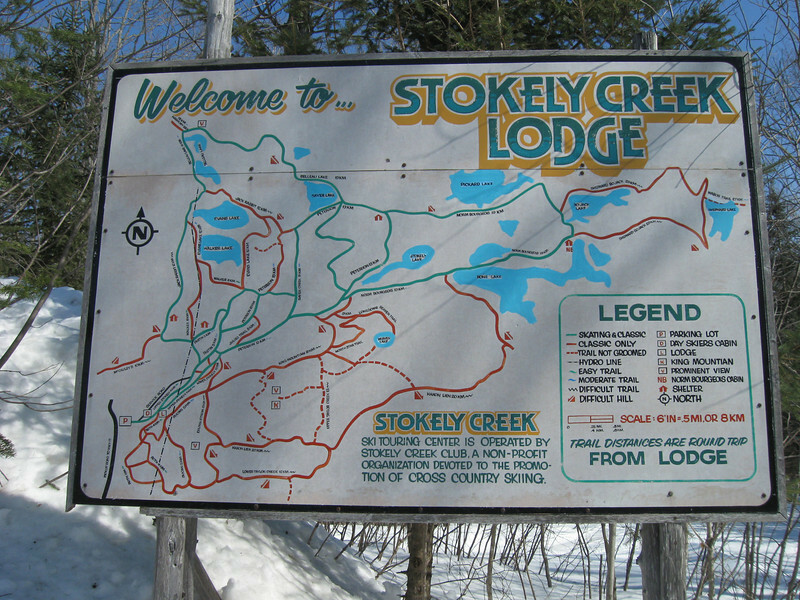 Stokley Creek continued their grooming operations until the Ski The Lakes Weekend in March. Mary and I were fortunate to have been able to ski most weekends on the trails during the past month. The past weekend, Easter Sunday we ventured back for one last season closing day trip. With the lodge closed we had the trails to our selves. They were 100% snow covered beyond the lodge, with well over a two foot base in most areas. Starting out at 11:00am from the parking lot, the snow was still crusted over, but the warming sunshine and windless day would soon loosen up the snow for a perfect day of skate skiing the upper lakes. The Peterson trail out to Bone Lake and the warming hut at Norms cabin was exceptionally firm, and fast. With a short break at the warming hut at noon, we headed out on the Pickard Lake trail shaded from the north slope remained firm and fast. We took the new trail heading north on the logging road for a quick 2K run which led over to Sayer Lake and the upper lakes of Bella and Evans. The short trail on the east side of Sayer was starting to melt off in the days of ongoing sunshine. The view above Bella to the west and the Haviland Bay area of Superior was clear, blue skies and the sounds of running water as the sunshine worked the upper iced ridges. The ski around Bella over to Evans lake found a few blow downs that required stepping out of the skies and into the knee deep snow. We headed back on the main Walker lake trail and took the cut over in the valley below the King Mountain cabin inorder to avoid home run hill, which was burning off in the afternoon sun. skiing back along the raging waters of Stokely Creek brought us back out behind the lodge and return to the parking lot at 4pm. Amazingly enough the snow remained firm but for the inch or so of corn snow made by the mid afternoon temps in the upper 30F, to lower 40F. The skiing will remain super over the coming week as the night time temps continue to lock up the melt and with no rain, erosion of the snow base will be minimal. We will end this season on a super memory of the Sunday Easter ski at Stokely 2009! !